A recreation of the Minneapolis Symphony Orchestra's first-ever performance at Northrop Auditorium — climaxing with the 1812 Overture — will be performed by the musicians of the Minnesota Orchestra under the baton of returning conductor Osmo Vanska on May 2, 2014 at the newly renovated Northrop, the University of Minnesota announced on Thursday at a press conference focused on the campus landmark's coming rebirth. 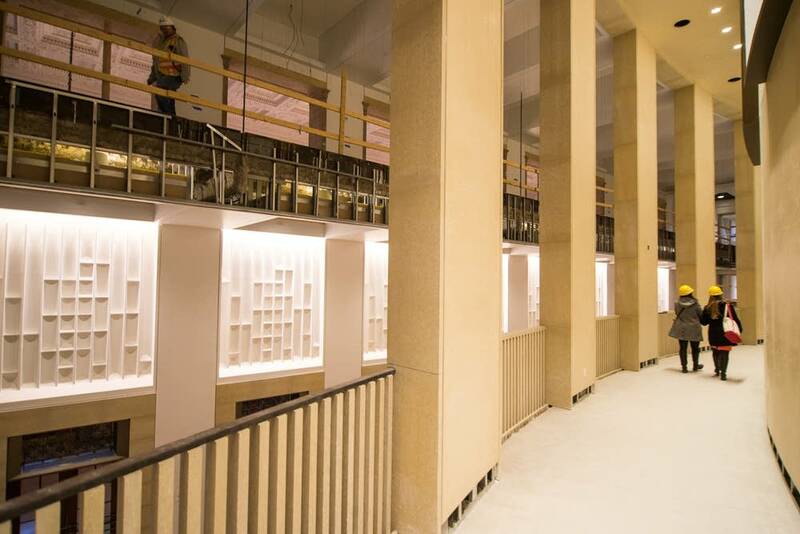 The venue, which has hosted innumerable performances in all genres since its 1929 dedication, will reopen on April 4 after over three years of construction that are radically transforming the building's interior spaces. Construction is still very much in progress, but on Thursday, media representatives were taken on a hard-hat tour of the site. 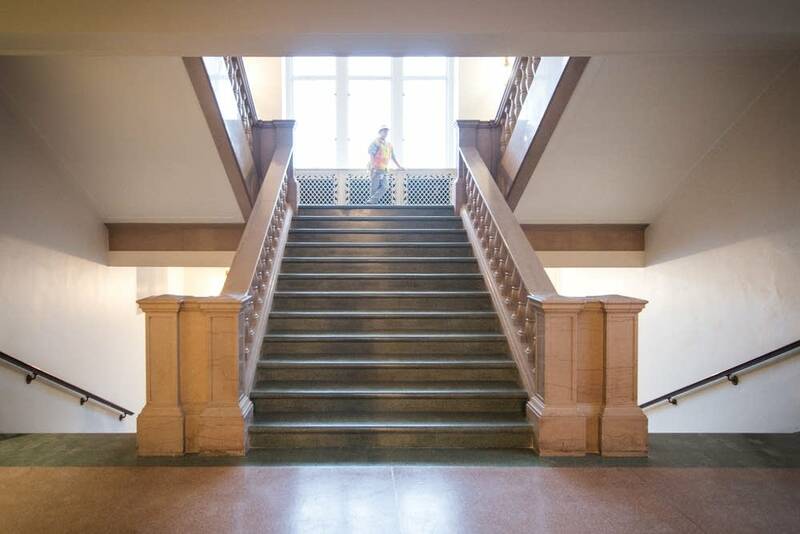 The changes are among the most significant ever made to a local venue of Northrop's size, on par with rolling the Shubert Theatre across downtown Minneapolis to become the Cowles Center for Dance and the Performing Arts. 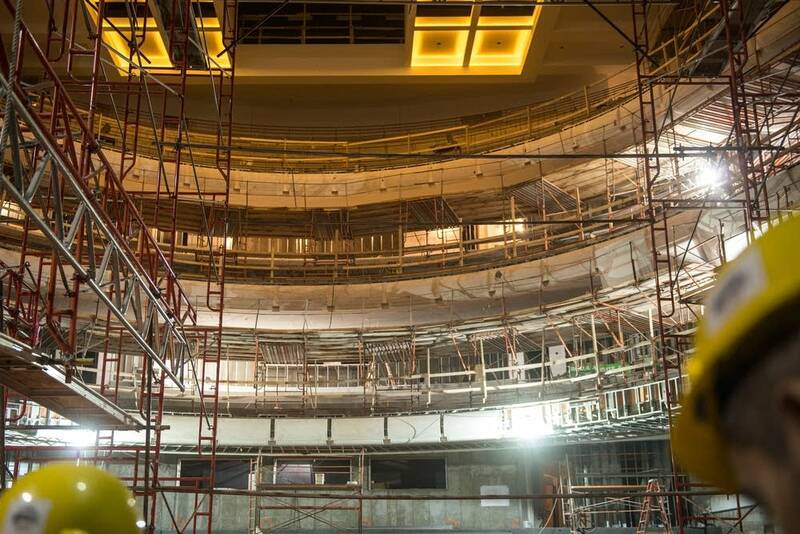 The auditorium space is being completely rebuilt, creating three balconies where there once was only one. 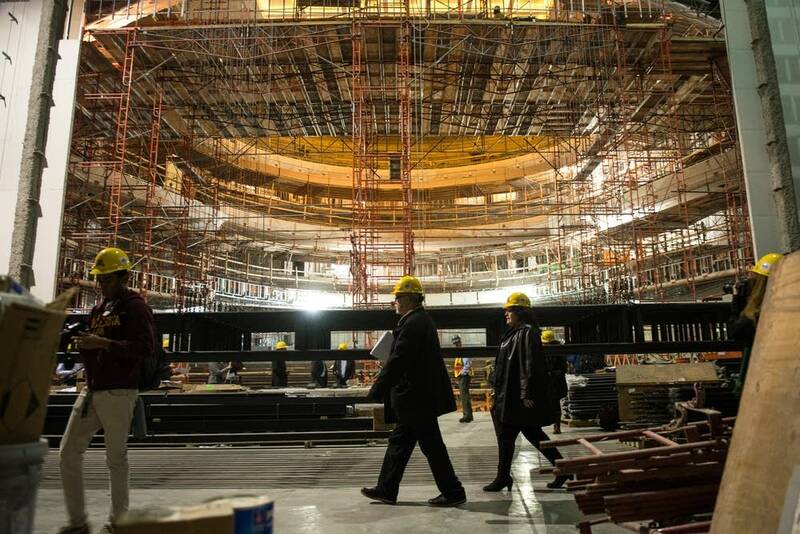 The seats will be closer to the center of the stage--82 feet away, on average, compared to a previous average of 97 feet--and there will be over 2,000 fewer of them. The former capacity of 4,847 (as a Local Current infographic shows) had the Northrop holding nearly as many concertgoers as Roy Wilkins Auditorium; Northrop's new capacity of 2,700 (revised from a previously reported figure of 2,800) makes it only slightly larger than Orchestra Hall with its capacity of 2,450. 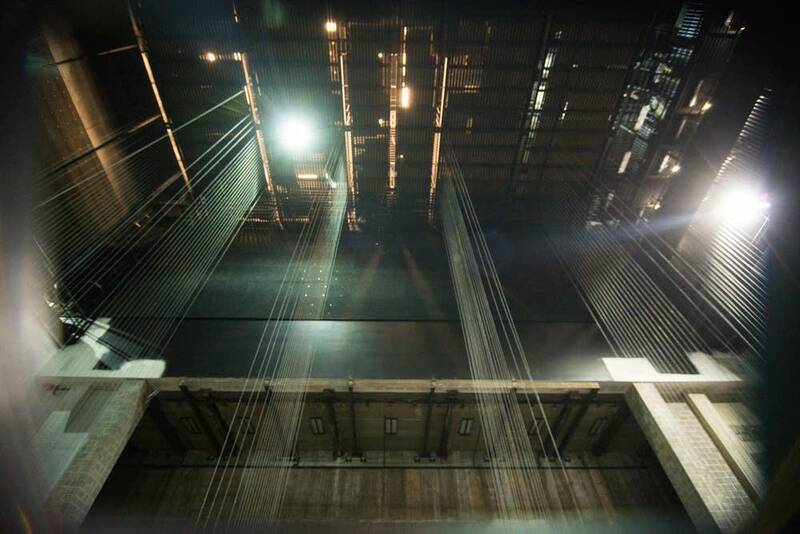 Further enhancements to the auditorium include a new loading dock (significant because it allows the venue to host much larger productions); improved acoustics (including banners that will unfurl to reduce the reverberations of amplified shows); and an out-of-sight backstage crossover that will allow performers to move from one side of the stage to the other without, as was previously the case, needing to go down and run through the basement. 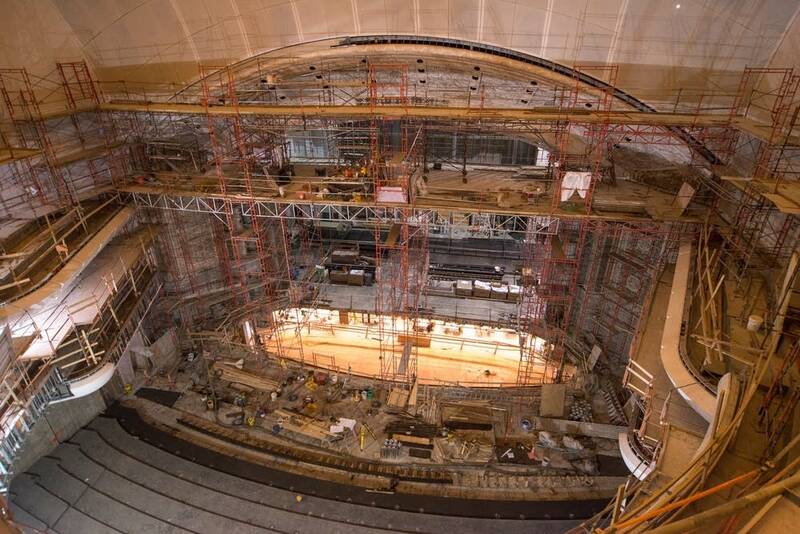 The new orchestra pit will be adjustable to function at three different levels: as a conventional sunken pit, as a floor-level space for additional seating, and as a stage-level space giving the performers extra room to roam. Furthermore, every seat will, at least theoretically, be a tweet seat: a wireless network will afford capacity for each and every person in the venue to be simultaneously online. That's all not to mention the whole new theater being built in addition to the main auditorium. Having moved the venue's back wall forward, HGA Architects and Engineers used part of the under-balcony space to build a 168-seat hall — the Best Buy Theater — that's intended to host films, lectures, and other events. 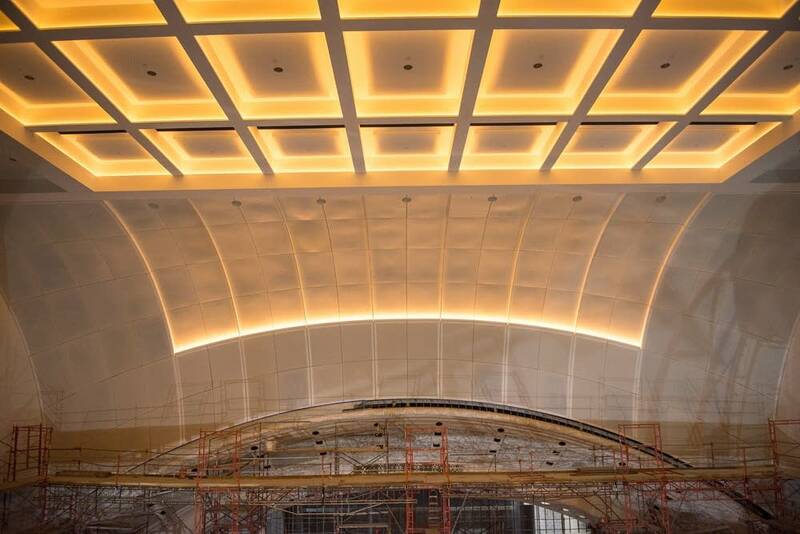 The two spaces are being acoustically insulated from one another, so both the main auditorium and the smaller hall can be used simultaneously. 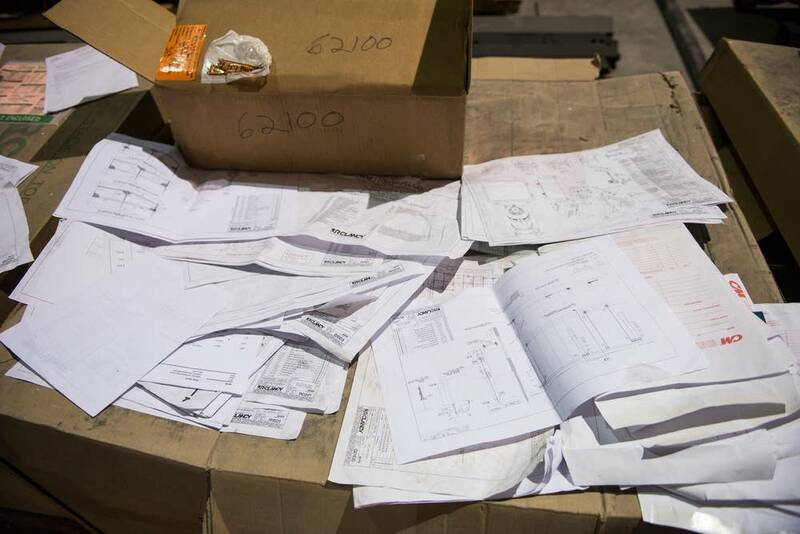 The broader goal of renovations, architects said Thursday, is to change the role of the auditorium from a "rock in the stream" of campus life to a central crossroads. 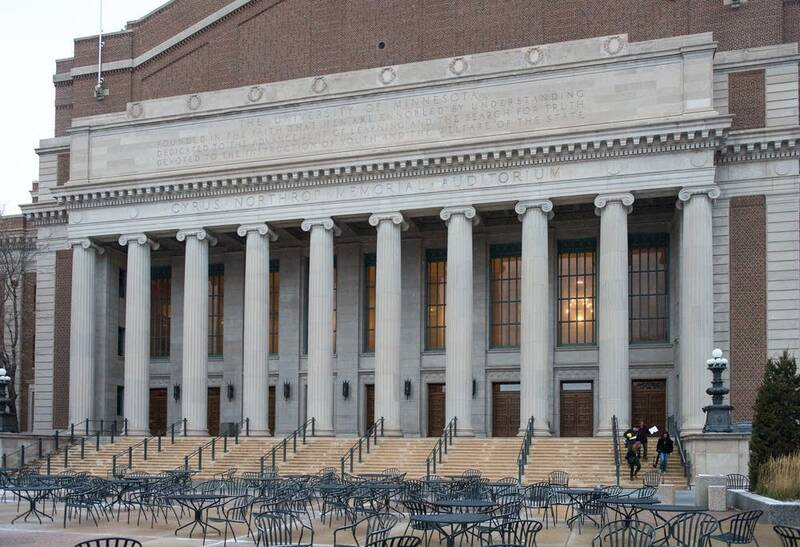 Students will be invited to hang out at Northrop even when a show isn't scheduled, enjoying the venue's renovated public spaces including a picturesque mezzanine with a view across the lawn to Coffman Memorial Union. 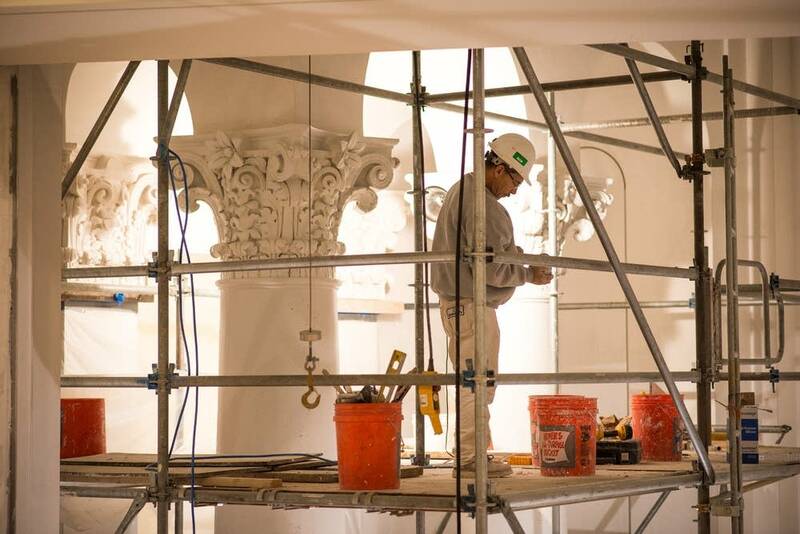 A new reception space ("the Founders' Room") will facilitate the kind of wining and dining that helps to generate funding for projects like this ambitious reconstruction. Northrop will officially reopen on April 4, 2014, with a performance of Giselle by American Ballet Theatre. Other performances scheduled for the venue's comeback season include a live broadcast of A Prairie Home Companion and the University of Minnesota School of Music's University Symphony Orchestra playing Mahler's second symphony — the work, appropriately, also known as the Resurrection.